The Lavender Run is an event you won't want to miss! This RunFit run will take place in the beautiful Village of Los Ranchos (Los Poblanos Open Space and adjoining neighborhoods) on the trail and roadways and starts and finishes at the annual Lavender Festival. Complimentary entry into the Lavender Festival, great t-shirt and a whole lot of fun! Please note: For family and friends and all others who are not participating, we will have available for sale 2 for $10 tickets during the duration of the packet pick-up at Steel Bender. Normally the tickets are $8 each. We encourage everyone to purchase early to bypass the long lines at the entrance. You may drop off articles of clothing and personal items in a clearly-marked bag at the Packet Pickup/Registration table next to finish on race morning. Volunteers will monitor your belongings during the race. We will do our best to keep your items secure; however, we are not responsible for lost or stolen items. If you are not able to pick up your packets in person, you must make arrangements for a representative to pick up your packet. Any out of town participants may pickup their packet on race morning at the registration area near finish. Lavender Run will be located near the Agri-Nature Center (Just west of Los Poblanos’ Fields – across from the Unser Racing Museum) NOTE: ALL PARTICIPANTS WHO WOULD LIKE TO BE ENTERED IN THE RESULTS AND BE ELIGIBLE FOR AWARDS MUST WEAR A TIMING CHIP/BIB. Note: All races will start promptly at the designated times listed above. Allow plenty of time to get to the Start in order to seed yourself according to your projected pace time. If you are driving to the race plan to arrive early. See parking information below. PLEASE USE DESIGNATED PARKING AREAS ONLY. DO NOT PARK ON ROADS OR ON COURSE. Port-a-potties are located near start/finish. Please allow plenty of time prior to the race start times to use the restroom. The event officials have the right to withdraw any runner from the race that appears in distress or at risk. If you have a health or medical problem at the Finish Line, please notify event officials or volunteers. Please cooperate if you are asked to go for a checkup. If you feel that you need help at any point, please ask for it! If you are unable to finish the race for any reason, please notify a race official of your bib number so that the medical personnel are aware. Yes, participants may wear their GPS watches. However, these items do not count as “second timing devices" and will not be recognized by the event as official times or distances. The use of video devices, cell phones, computers, cameras or any similar devices by participants in the event is prohibited. The use of wheeled devices by participants or any other person authorized to be on the course shall be strictly limited to: (a) authorized course marshals on bicycles. Baby joggers, baby strollers, skateboards, rollerblades, unauthorized bicycles or any other wheeled device will not be permitted. The timing chips you will be wearing are disposable and do not need to be returned. The overall and division award winners will be announced at the Awards Ceremony on race day – immediately following the Kid K.
Age group prizes will be given to the top three finishers in the following categories for men and women: 19 and Under, 20-24, 25-29, 30-34, 35-39, 40-44, 45-49, 50-54, 55-59, 60-64, 65-69, 70-79, 80+. Award times will be determined by gun time. Age group prizes will be given to the top three finishers in the following categories for men and women: 9 and under, 10-12, 13-15, 16-19, 20-24, 25-29, 30-34, 35-39, 40-44, 45-49, 50-54, 55-59, 60-64, 65-69, 70-79, 80+. Award times will be determined by gun time. Award times will be determined by gun time. Top 3 teams will be awarded overall team awards. Note: Individuals are eligible for age group and overall awards. All registered participants (11 and under) are eligible to participate in the Kids K. The start of the Kids K will begin at 9:15 immediately after the 4M and 10K. The race director will make announcement 15 minutes prior to start to make sure all Kids K participants make it to the start on time. The start of the Kids K will be near the RunFit finish arch. All participants will receive a special recognition award at the finish. 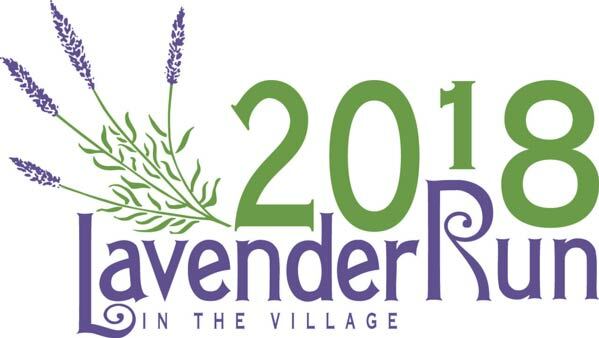 Lavender Run participants will receive a complimentary entry into the 12th annual Lavender Festival immediately after the event. The Lavender Festival includes live music, free yoga classes, a Kids Camp, wellness seminars, cooking demonstrations, and 70 artisans offering everything from lavender bouquets to lavender paintings, pies, spices, lotions, beer, and wine. A perfect day for lavender lovers of all ages. There are fluid replacement stations: Water (4M & 10K) and Water & Gatorade (10K). 4M - 10K: Majority of course will be on the Bosque ditch banks, roadways and trails. Courses will be well marked with volunteers and aid stations. The Lavender Run is fortunate to have some of the friendliest and hardest-working volunteers around. Volunteers help us on race morning to ensure you feel welcomed, are fully informed and have a safe, successful and positive running experience, and more! When you have a chance, give a hearty, fun-loving thanks!